The Florida Keys Overseas Heritage Trail features more than 70 miles of existing trail paved in segments along a planned, 106-mile corridor from Key Largo (Mile Marker 106.4) to Key West. Much of the remaining trail is now in design or under construction by the Florida Department of Environmental Protection and is funded by the Florida Department of Transportation through a federal grant program for alternative transportation. From Miami, take U.S. 1 to Key Largo and the various trail access points to Key West. The Florida Keys Overseas Heritage Trail (FKOHT) is being developed and managed by the FDEP, on Florida Department of Transportation (FDOT) right-of-way, with Monroe County and local citizen collaboration, as a linear world-class, multi-use bicycle and pedestrian facility that will traverse the Florida Keys from Key Largo to Key West. 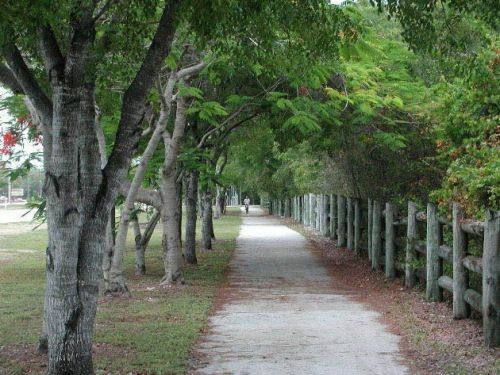 This recreational greenway includes an integrated system of educational kiosks, roadside picnic areas, scenic overlooks, fishing piers, water access points, art, bicycle and jogging paths serving both residents, and visitors to the Florida Keys. The trail promotes health opportunities and provides a mechanism for the preservation and use of the historic Flagler Railroad Bridges. The historic Flagler Railroad Bridges are monuments to the test of time and are a major part of the modern landscape of the Florida Keys. The bridges were built by Henry Flager in 1904 and completed in 1912. Of the original 42 bridges built by Flager, 23 remain and are nominated for the National Registry of Historic Structures. The trail and historic bridges access six National Wildlife Refuges, the Florida Keys National Marine Sanctuary and border the World Heritage Site of Everglades National Park, Biscayne National Park and four underwater recreation areas. There are also twelve State Parks located along the trail. The trail parallels the Florida Keys Overseas Paddling Trail (Florida Circumnavigational Saltwater Paddling Trail, segment 15), and will eventually connect to the Florida Greenways and Trails system. The linear corridor serves a broad population by linking recreation areas, schools and businesses throughout Monroe County and offering unique opportunities for interpreting the many cultural, historic, ecological and maritime stories of the Florida Keys.